Difficult to implement database caching, etc. Your domain entities or business entities are strongly typed with annotations; and more. 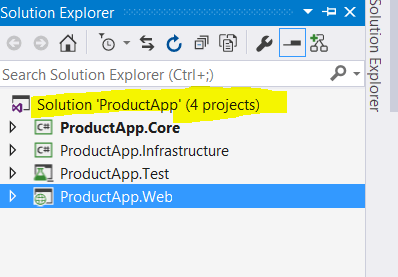 On the internet, there are millions of articles written around Repository Pattern, but in this one we’re going to focus on how to implement it in an ASP.NET MVC Application. So let’s get started! So far our understanding for different projects is clear. Now let us go ahead and implement each project one by one. During the implementations, we will explore the responsibilities of each project in detail. In the core project, we keep the entities and the repository interfaces or the database operation interfaces. The core project contains information about the domain entities and the database operations required on the domain entities. In an ideal scenario, the core project should not have any dependencies on external libraries. It must not have any business logic, database operation codes etc. Whether a particular property is required or not. For instance, for a Product entity, the name of the product should be required property. Whether a value of a particular property is in given range or not. For instance, for a Product entity, the price property should be in given range. Whether the maximum length of a particular property should not be given value. For instance, for a Product entity, the name property value should be less than the maximum length. It is purely up to us how we see data annotations. If we consider them part of database operation then we can apply restrictions using database operation libraries API. We are going to use the Entity Framework for database operations in the Infrastructure project, so we can use Entity Framework Fluent API to annotate data. If we consider them part of domain, then we can use System.ComponentModel.DataAnnotationslibrary to annotate the data. To use this, right click on the Core project’s Reference folder and click on Add Reference. From the Framework tab, selectSystem.ComponentModel.DataAnnotations and add to the project.